Before you ask, NO! It is most definitely not acceptable for you to put new shingles over old shingles. Some of you may laugh, but it is a question I have heard a few times, and I have even seen someone do this. “But it’s double the protection, right?” you ask. No, no it is not. There is so much more to replacing a roof then putting on a new set of shingles. In the United States, a roof gets replaced, on average, every twelve to fifty years. There are many factors that determine when your roof needs to be replaced. The primary factor in this determination is the material that was chosen for your rooftop. A general rule is that the cheaper materials will often need to be replaced the soonest. More expensive materials tend to last quite a lot longer. The most common material used for roofing purposes is that of composite or asphalt shingles. This is also the primary material we will be discussing today. However there are many other options available, for which we will discuss the potential cost as well as the positive and negative aspects of each material. As previously stated, asphalt shingles are the most common roofing material used today. One of the primary benefits of using asphalt shingles is the cost. It is generally the cheapest option available, making it a viable option for nearly any budget. Not only that, asphalt roofing shingles are available in a wide variety of cosmetic and functional forms. Standard asphalt roofing shingles tend to last approximately 20 years. This can change depending on the typical elements that it is exposed to. If you decide to go with asphalt shingles, you can always go for a higher end asphalt shingle that will last quite a bit longer. As you can imagine, the primary negative aspect of using asphalt shingles, especially if you use a lower tiered variety, is that they need to be replaced much sooner than other options, as they are more affected by weather and the elements than others. Nowadays it is common to see corrugated metal used as a roofing option. These are also available in a wide variety of cosmetic options, which is definitely a bonus. These afford the homeowner with a much more modern look. Another benefit to this roofing option is the fact that they are much more energy efficient and durable than their asphalt shingle counterparts. This metal roofing material can last over twice as long, up to fifty years! That means that there is much less upkeep and maintenance required. In addition to this, the efficiency of the metal roofing can actually help to insulate your home and help to lower your monthly electricity bills. That is definitely a positive aspect of this type of roofing material. Whereas the look of this material is modern, many people do not like the aesthetics. The feel that the corrugated metal on the roof has much less curb appeal than other options. Some other roofing materials available are quite a bit more expensive, but they can be very aesthetically pleasing, however, they are quite a bit more expensive. Just a couple of these include clay and wood shingles. As far as clay shingles are concerned, these actually have quite a bit of curb appeal. They are pleasing to the eye and they can last just as long as the metal roofing, up to fifty years! 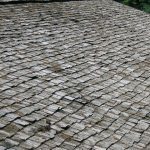 The wood and shake shingles, on the other hand, look quite good as well, however, they only last up to thirty years, but that is still ten years longer than average asphalt roof shingles. No matter your budget, there are options available for you to replace your roofing material with something new. Make sure you choose what is right for you. 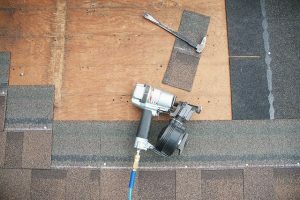 Because of the fact that asphalt shingles are the most common roofing material used today, the rest of this article will be concerned with those. The reason that these are the most common is very simple, cost. The overall cost of replacing the asphalt shingles on your roof can cost between $600 and $4,000 for an average sized home. Now, that is for you DIYers out there. It can be much more expensive to have these installed professionally, ranging from $1,500 to $10,000. If you don’t know what you are doing, I would avoid the DIY route. The additional cost of professional installation is so much more for a reason, and it goes beyond just the cost of labor. The longevity of your roof, that is how long the shingles last, is dependent entirely on how well they are installed. If you are looking for a company to redo your roof for you, then you should be sure to do your research. There is a huge difference in a professional company installing the shingles at a higher rate and the guy down the road that will do it dirt-cheap. He may know what he is doing, but that doesn’t mean that the quality will be the on par. The last time I had my roof redone I actually stuck around and watched how the pros do it. This was over five years ago. I wanted a better understanding of how to complete this task on my own the next time the need arises. It was hard work, and labor intensive. When the time comes, I may just call them back! One of the misconceptions that I had about the shingles was how they were actually fastened or attached to the roof. I always thought all you had to do was simply nail the shingles in place in the appropriate pattern, and I couldn’t’ have been more wrong. I already understood the obvious importance of safety. I would never do any work on an elevated surface without having appropriate safety precautions, and neither should you. What I didn’t know, however, was that first and foremost the roof has to be clean and smooth. This is very important for how the final product for the home will look. If you want your shingled roof to look clean and smooth, then you want what is underneath to be just as clean and smooth. I had never even given this any consideration. You also have to think about what layers you may need below those shingles. If there is a lot of rain or snow in your area you may need an additional layer to help further protect your roof. This is considered to be a secondary protection for your roof, or an underlayment. I had absolutely no idea how much more went into roofing other than just shingles. It was explained to me that this layer is almost as important as the shingles themselves. Remember, these are designed to last between 20 and 30 years. With that in mind, any water or wind-blown rain that ends up between the shingle and the actual roof will cause problems down the road, limiting the lifespan of the shingles and potentially resulting in much more work and money into repairs. That is why it is so important to make sure that you have the correct underlayment setup for your specific region. You may not believe it, but the very first layer on your roof is just as important as the final shingle layer. Once you have stripped your roof down to the plywood, you need to do a thorough inspection. If you find any rotted portions, it will need to be replaced with some quality weather-resistant plywood. What is fortunate about this is the fact that it is an underlay. You don’t have to get the most beautiful pieces of plywood for this step. I chose to go with CDX 1/2-inch plywood, which is good outdoor use plywood. As long as you get weather resistant materials, you should be good to go. It is always important to take safety precautions, but especially so when working on this step. Your footing may not be as sure as it previously had been, so make sure to be safe when replacing the plywood layer of your new roof. Once you have your plywood selected, make sure to secure it using the appropriately sized nails. I used 8d common 2 1/2-inch nails. You want to make sure that you don’t space these nails out more than six inches, and no less than 3/8 from the edges of the plywood. If you live in a high wind area, it would be a good idea to go ahead and use more fasteners. It’s better to have a few too many than not enough. Another thing that I considered, but many others may not, is that you have to start placing shingles at the bottom edge of the roof and then work your way up to the top in order to achieve the appropriate pattern. Not only that, you have to account for anything that is on your roof, including any vents or sunlight. These areas have to be prepared for in special ways as well. Before following the proper stacking order for appropriate rain runoff, you have to consider the appearance. Many people decide to use three tab shingles. When roofers say shingles this is most often the kind of shingle they are referring to. Each shingle is actually made up of three tabs, which are those little rectangles. These are some of the most common asphalt shingles that you see today. You are more than likely going to have to cut areas of your shingles in order to make perfectly straight lines around your roof, which is necessary for that perfect curb appeal. But how do you do this? Do you go after it with a utility knife? Do you need a special tool? How do you get it perfectly straight? These are the questions that I had, as many other do. Really, you can cut your tiles in a straight line with nothing more than chalk, a chalk line and some shingle shears. That’s it, that is all you need to cut a professional looking, beautiful straight line on the edges of your rooftop. You may not be able to do it alone though. It could be a good idea to have a friend help you. Mark your chalk line where you want your cut, and then cut away with those shears. Now, not all shears are the same. And you can find them online for anywhere between $30 and $200. That is quite a price difference. I found a nice pair online for $60, so make sure you shop around and find what’s right for you. That is just one method for cutting these shingles in a straight line. There are others. For example, you can do the same procedure with the chalk line and use a nice sharp utility knife. You should already have a nice thick pair of gloves to wear to for protection and remember to always cut away from yourself in a controlled manner. You can find a good utility knife online for $9 to $50. Mine was $14.95. Another tool, that you might consider being a bit safer, would be a roofing cutter or hook knife. That is what the guys that did my roof used. These are drawn along the chalk line towards you in order to cut that same straight line. These range from $10 to $150 if you are shopping online. In my opinion, I would prefer to use the shingle shear and chalk line method. I feel that method has the most control, especially when you are cutting around and into corners. I find that the angles can be made to be much rounder and smoother using a nice pair of quality shears. In fact, even though the hook knives were the primary tool, the gentlemen that did my roof used shears for those same corners. Another thing that I was completely wrong about was how to finish the peak of the roof. Originally I thought that folding the shingles over and connecting the sides finished off the peak of the roof. Again, I was wrong. There are actually special shingles that are used for the peak of the house. These are called ridge cap shingles. There is no bending or folding necessary with these babies, but there is something a bit complex about them. You have to consider if there is a slope along the peak of the house. If so, follow the same rules as before, starting at the low end of the slope and working your way up to the top of the slope. If the peak of the roof is level or falls off equally, then you will need to figure out your prevailing wind and start on the opposite side. Why Go With Asphalt Shingles? As we have already discussed, asphalt shingles are the cheapest option, however, they do have a variety that can change the look or increase the amount of time necessary before a change is needed. The options available make it more viable even for those not on a budget, as the result can last up to 30 years! Not only that, it is a very customizable and traditional look that has the potential for wonderful curb appeal.